talks, resources and reasons to be creative « HIDIHO! it all started with the Processing Cities, first in Paris then in Bordeaux, in both cases, it was a 3 hours workshop in Processing (obviously), the idea was mostly to review the basics. it was a pretty interesting exercise for me, I don’t know if the attendees were satisfied, we didn’t have much time to discuss afterwards. it was very hard to evaluate the session also because the attendees had very different skills, backgrounds and expectations. this is precisely why the Processing community is interesting ; people are very transversal. I tried to push them on OpenProcessing, but it wouldn’t work… it should run properly on any version of Processing. 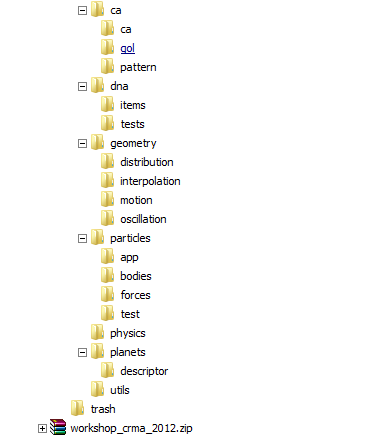 I didn’t credit all the people I took code from, but you can browse the Openprocessing. if you’re interested in this kind of things, make sure to check Daniel Shiffman’s blog and his nature of code book’s site. he explains very well. then there was the almighty FMX13 in Stuttgart which was a real crash test for me, huge amount of stress as the other speakers are people whose work I venerate. the track was curated by Frank Reitberger, the stage was huge, we had a 12 m wide screen, everything was ready and then, the sun came out and lots of people preferred to rest in the grass rather than sit in a dark room. In the end everything went fine (sort of), it was a great experience. the most recent event I talked at was the WWX13, as mentionned in the previous article, I started using Haxe NME as an alternative to Flash. 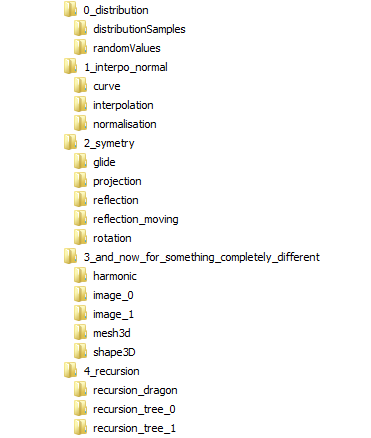 then I prepared a workshop with all kinds of animation principles mostly to get used to the language itself. particles is a step by step particle system which some “physics” constraints. the code is provided as such, and might just fail miserably but with some patience, one might get it to work with the latest version of Haxe. so I had piled up a bunch of stuff in HAXE and when I heard about the conference, I thought it might be a good idea to give it a try. the conference was great, rather confidential as compared to the FMX or the upcoming Reasons To Be creative but still. I had a chance to attend sessions by some of the brightest people of the industry and hanging out with them was a real privilege. Silex Labs who organized the gig (and some smaller haxe-centered events), recently released the videos of the speakers. if all of the talks are interesting, I’d recommend Nicolas Cannasse’s, Valérie Alloix and Joshua Granick’s sessions first. in September I’ll be part of the Reasons To Be Creative festival. I can’t express how proud and cheerful and stressed I am just thinking about it. this is simply the best festival for people that create visuals with code. the venues are awesome, the speakers are insanely talented and their sessions really make you a better coder/artist. anyway thanks for reading, thanks to those who invited me so far and I hope to see you in Brighton!